Elegantly constructed and superb value. The F.P. 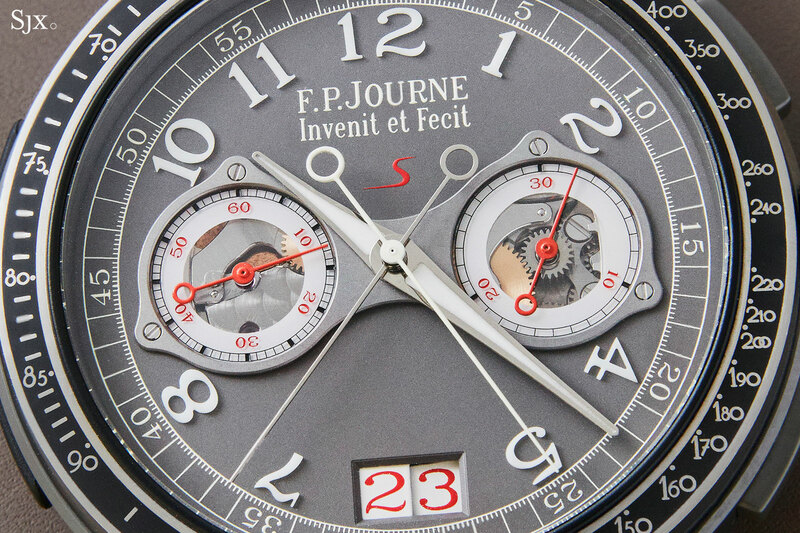 Journe Line Sport Chronographe Monopoussoir Rattrapante is a paradox. Within the F.P. 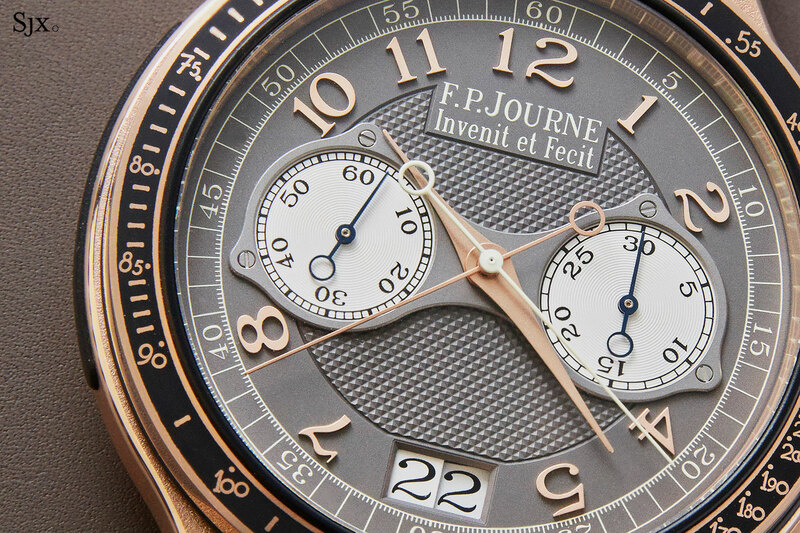 Journe line-up, the watch is probably the best value for money, and in the broader market, one of the strongest value propositions in high-end split-second chronographs, by quite a margin in fact. At the same time it is not classically handsome in the traditional F.P. Journe style, and visually it takes a while to get used to, although it wears wonderfully on the wrist. Delving into the details of the watch, however, illustrate the thought that was put into its construction, especially for the movement. The movement has obviously been designed with practicality in mind, evidenced by its thinness, the large date and lengthy power reserve. 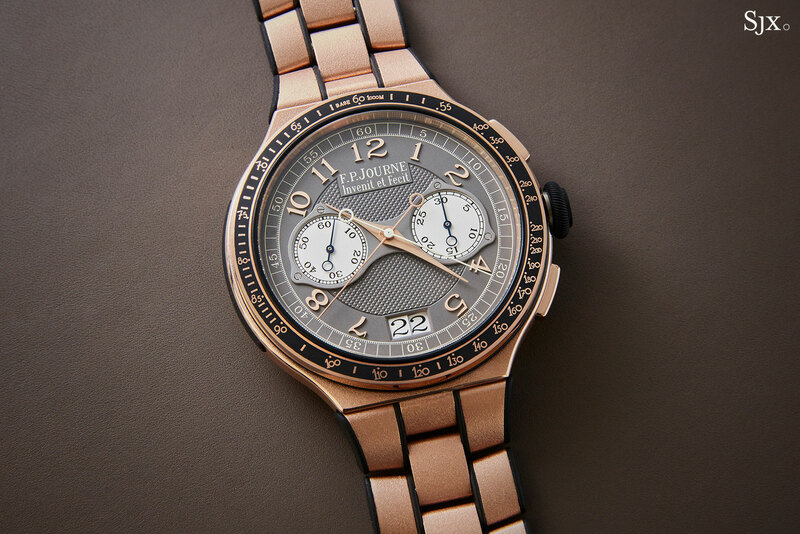 The Chronographe Monopoussoir Rattrapante is a large watch by the numbers – the case is 44mm – but like most F.P. Journe watches surprisingly well proportioned despite the size. Though the case is large, its effective size on the wrist is smaller, because it has no lugs. And it is also thin, just 12mm high. It’s not quite as slim as the Vacheron Constantin Harmony split-seconds, which at 8.4mm has the title of the thinnest split-seconds on the market, but still remarkably thin for what it is, and well suited to the case diameter. The impression of thinness is cleverly enhanced by the case construction, which consists of a narrow case band, along with a high bezel and back. This means the dial and movement can be accommodated while leaving the watch feeling slim, especially on the wrist. And then there are the rubber inserts on the case side, crown and bracelet. 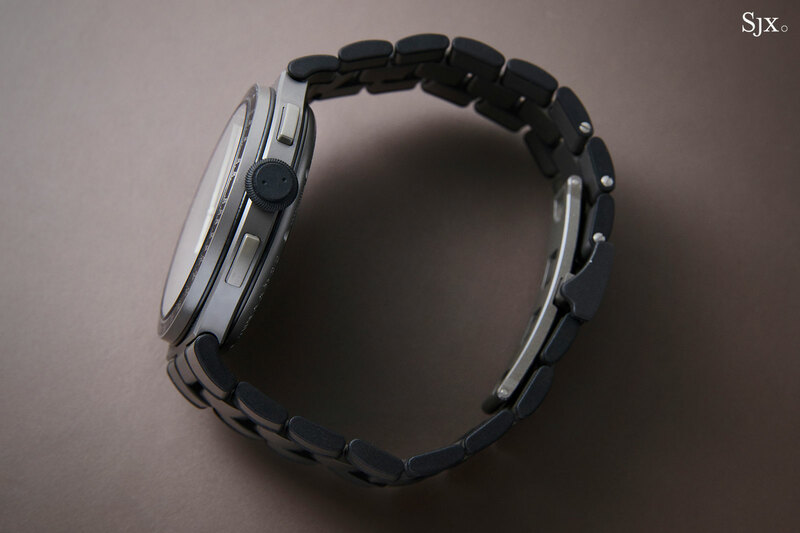 Installed as bumpers to improve shock resistance, they feel out of place on what is a meant to be a timeless luxury wristwatch, even one intended for sports. On the bracelet they serve a functional purpose, capping the open ends of the hollow bracelet links, but they don’t look very good. 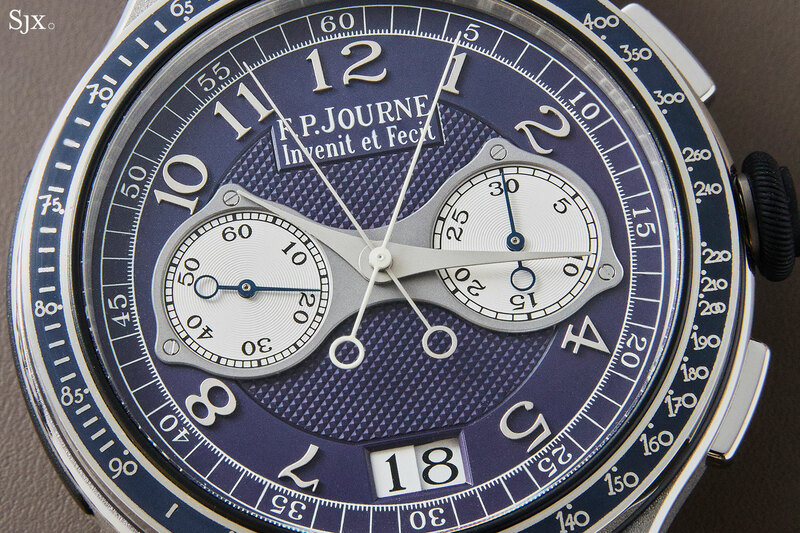 It appears Mr Journe has taken some criticism of the rubber inserts to heart, because the next generation of Line Sport watches will be absent the rubber bits. Compared to the large case diameter, the bracelet appears a touch too narrow. It’s not obvious on the wrist, but apparent when the watch is laid flat on a table. 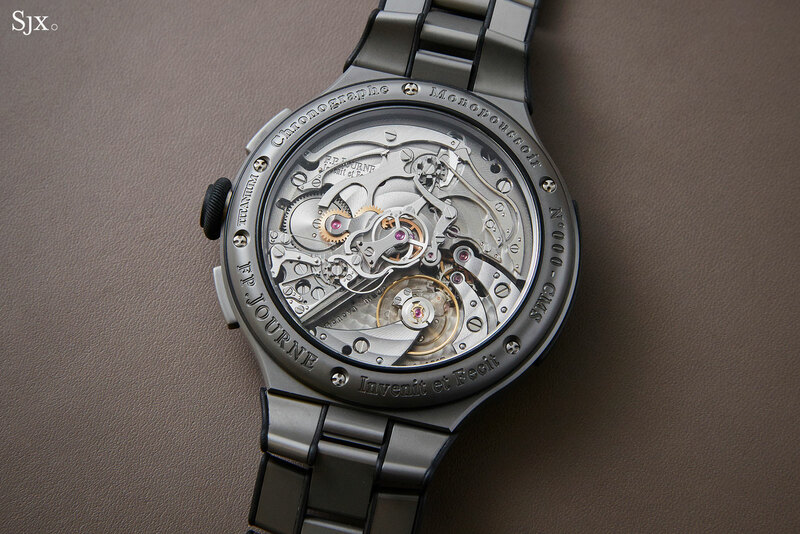 Nonetheless, the good proportions of the case means the watch wears well, especially in titanium, being especially light. Notably, while the gold and platinum versions are weightier than the titanium, they are surprisingly light given the size and material, largely because the links of the bracelet are hollow. 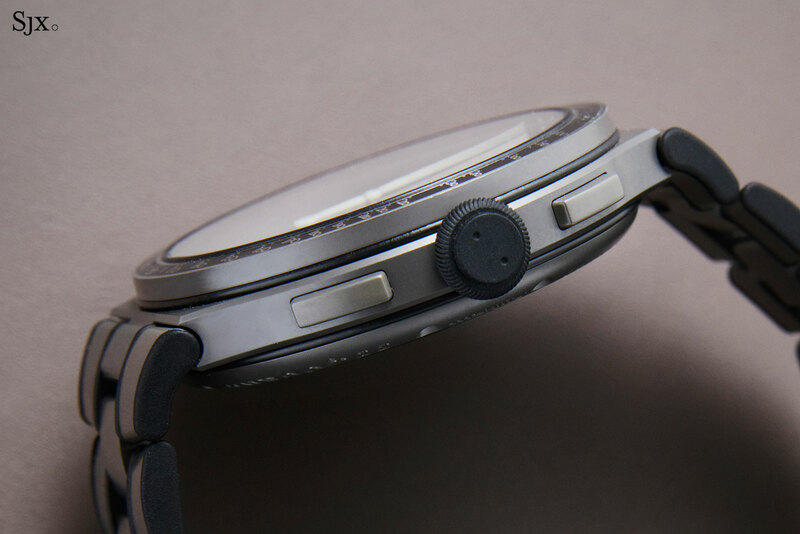 While all versions share the same case and bracelet construction, the surface finishing is distinct. The titanium model has a smooth, blasted surface that gives it a silky touch, but the gold and platinum versions have a granular, frosted surface that catches the light nicely. The differing treatments are no doubt a result of the surface hardness of each alloy, but also suit the respective aesthetics well. Bottom line for the case: even though I still haven’t warmed to its look, it feels good on the wrist, particularly in titanium. It manages to be uncommonly light without feeling inexpensive or plasticky. Because F.P. 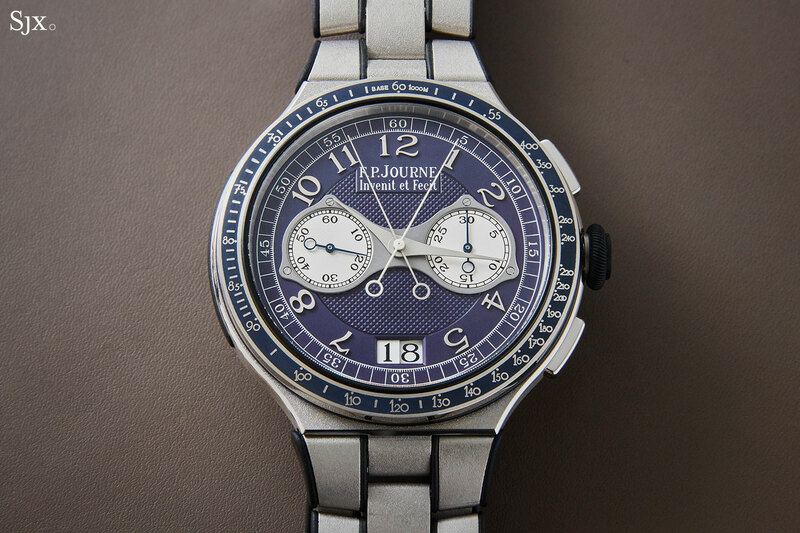 Journe co-owns a dial factory, Les Cadraniers de Genève, along with Vacheron Constantin, its is able to offer a diversity of dial styles and materials of impressive quality, an unusual feat for a brand that makes just 900 or so watches a year. 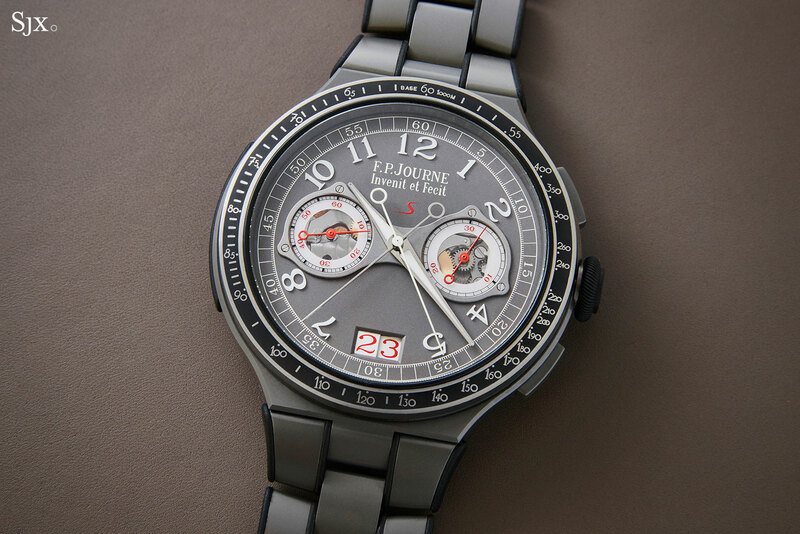 The dials of the Chronographe Monopoussoir Rattrapante are smartly executed, even for the entry-level titanium model. All three models share the same basic dial design, with different decoration and details. Since the dial is big, legibility is excellent, with even the numerals of the minute track being large. But the tachymetric scale, being a narrow band of ceramic filling, feels cramped with several of the numerals being difficult to make out. Although the precious metal versions have fancier dials – they are solid gold decorated with hobnail guilloche and featuring solid gold applied numerals – the titanium model is the most suited to the spirit of a sports watch. As it was with the earlier generation of Line Sport chronographs, the titanium rattrapante has clear sapphire sub-dials that reveal a bit of the mechanics under the dial. The grey dial is actually made of aluminium, with an unnecessary stylised “S” in red that looks too much like it came off a car. But the design works, and it is the most attractive of the trio. It is also the only dial with luminous markings. But what really matters here, and what makes the watch good value, is the movement. The cal. 1518 is a hand-wound, single-button split-seconds chronograph movement. It’s single-button, or monopoussoir, because start, stop and reset are controlled by the pusher at two, while the pusher at four controls the split-seconds. While the precious metal and titanium versions share the same calibre, the materials used to build the movements are different. For the sake of lightness the titanium model has a movement with its bridges and plates in aluminium, while the gold and platinum models share the same movement that has its bridges and plates in 18k red gold. 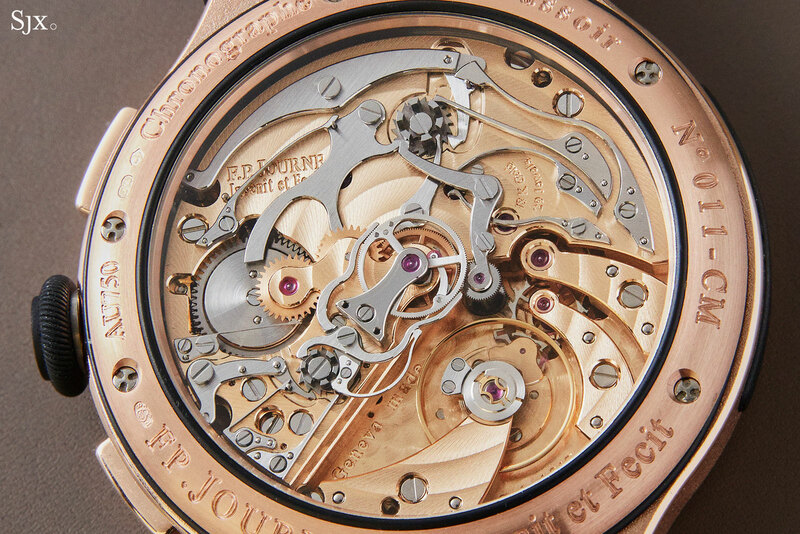 The finishing of the movement is identical to that of other high-end F.P. 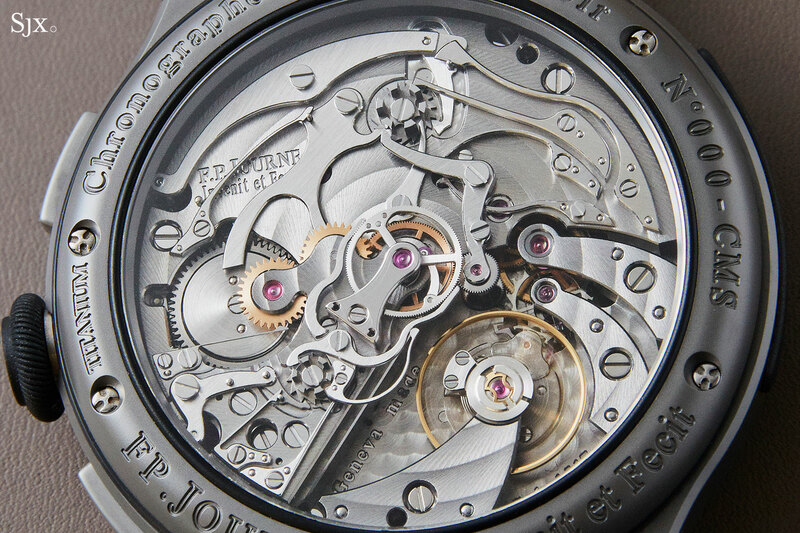 Journe watches, showing carefully applied and clean finishing that is done by hand for the most part, though certain elements appear to have been accomplished by machine. That being said, the finishing is not elaborate or extravagant, which was never a focus of the brand in the first place. While both the gold and aluminium movements appear to be finished identically, the gold bridges and plates look better, being brighter and seemingly shinier. The aluminium, on the other hand, feels a bit flat. 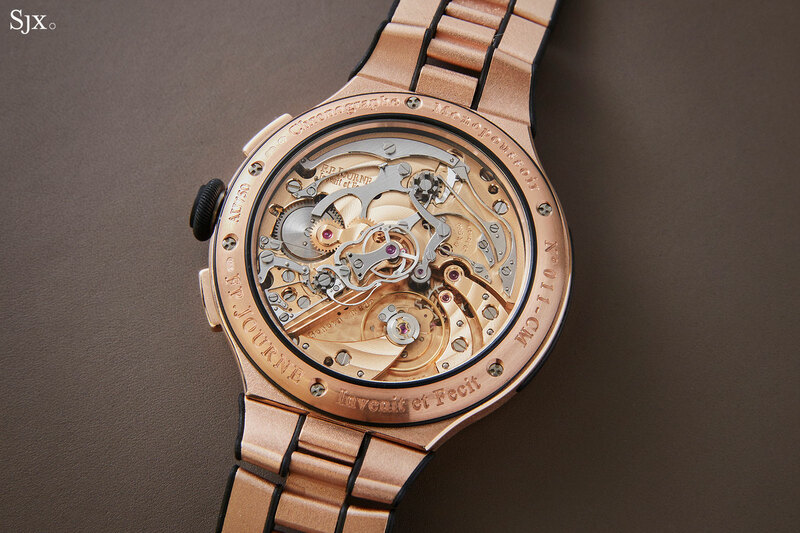 The movement is only 6.8mm high, a substantial accomplishment given it also boasts a big date display. By comparison, the record holder in the Vacheron Constantin Harmony split-seconds is 5.2mm high, while the runner up, the Patek Philippe CHR 27-525 PS, is 5.25mm high, but neither have a date display. Though thin, the movement is wide at 33.6mm in diameter, which accommodates a large enough mainspring for an 80-hour power reserve, unusually long for such a watch. A couple of elements in the movement construction jump out at first glance. It’s a large movement, but the chronograph levers are broad, flat and sit close to the plates, helping keep the height of the movement down. But there was no cost-cutting in this aspect of the construction, with none of the levers or springs being of the low-cost wire or coiled type. The result is a slightly less dense appearance than chronograph movements with traditionally styled levers that are narrow and high, like the L951.1 in the Lange Datograph. A good comparison is the recent Montblanc 1858 split-seconds, which has an old fashioned Minerva split-seconds movement inside. It’s worth noting, however, that the split-seconds mechanism lacks an isolateur, or isolator mechanism. This is typically found in modern high-end split-seconds chronographs, and serves to reduce drag when the split-seconds hand is stopped. When that happens, the split-seconds wheel is stopped by the pair of pincer-shaped clamps, but the chronograph wheel continues to turn as the seconds hand continues on its way. An isolator disengages the split-seconds wheel, reducing the friction generated by the frozen split-seconds wheel. However, the isolator adds an additional level to the split-seconds mechanism, increasing the height of the movement, which is at odds with Mr Journe’s long held inclination for thinner movements (excepting the new Tourbillon Souverain Vertical). Before the Line Sport split-seconds, there was the one-off Chronographe Monopoussoir Rattrapante Bleu made for charity auction Only Watch in 2017, which sold for over US$1.15m at Christie’s. Featuring a tantalum case and reflective blue dial in the style of the Chronometre Bleu, the Only Watch split-seconds was powered by the cal. 1517, a movement related, but distinct, from the cal. 1518 in the Line Sport rattrapante. The most obvious difference between both movements is the chronograph coupling, which is how the chronograph mechanism is engaged and disengaged from the wheel train. That is why the chronograph mechanism inside the cal. 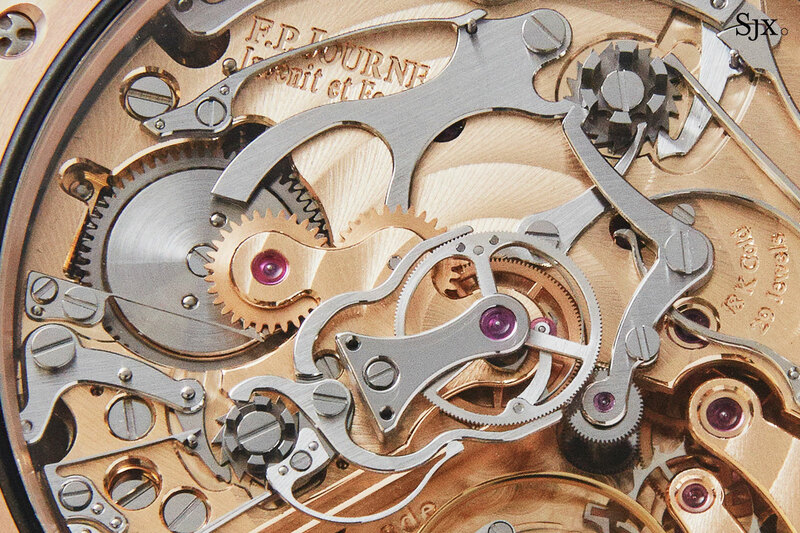 1517 of the Only Watch split-seconds appears more densely constructed. The cal. 1517 has a traditional horizontal coupling, but executed in an unconventional manner. 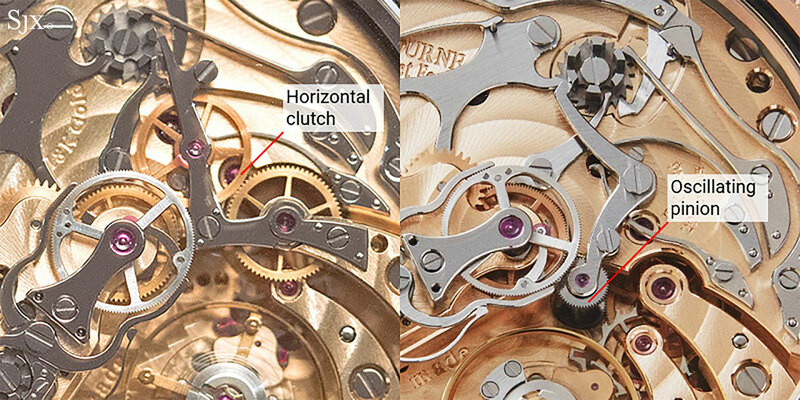 The clutch engages counterclockwise, when viewed from from the movement side, which is rarely seen on modern watches. 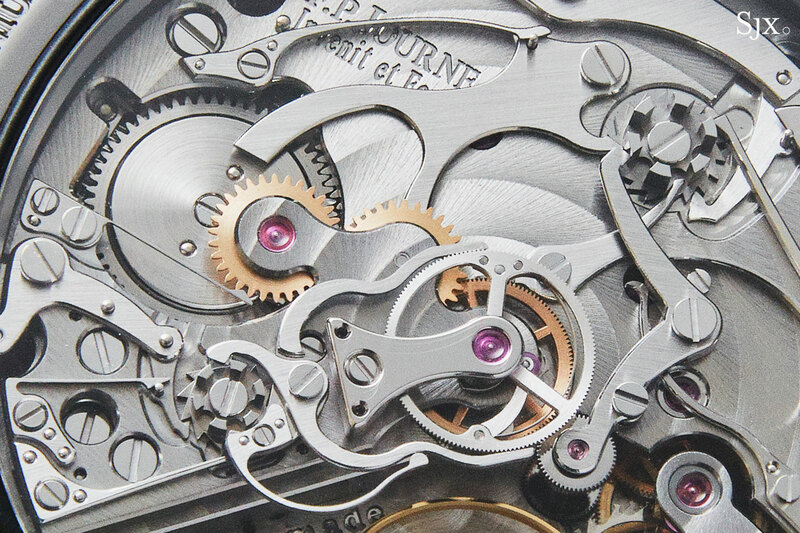 A downside of the horizontal coupling construction is the potential for chronograph “stutter”, where the chronograph seconds hand jumps when it is started, due to the imperfect meshing of the chronograph wheel slightly. Because the clutch engages counterclockwise in the cal. 1517, the chronograph hand can jump backwards, instead of forwards as in most cases of “stutter”. The potential for stutter is reduced significantly in the Line Sport rattrapante, because the horizontal coupling has been replaced with an oscillating pinion, favoured for being more compact and quicker to engage. 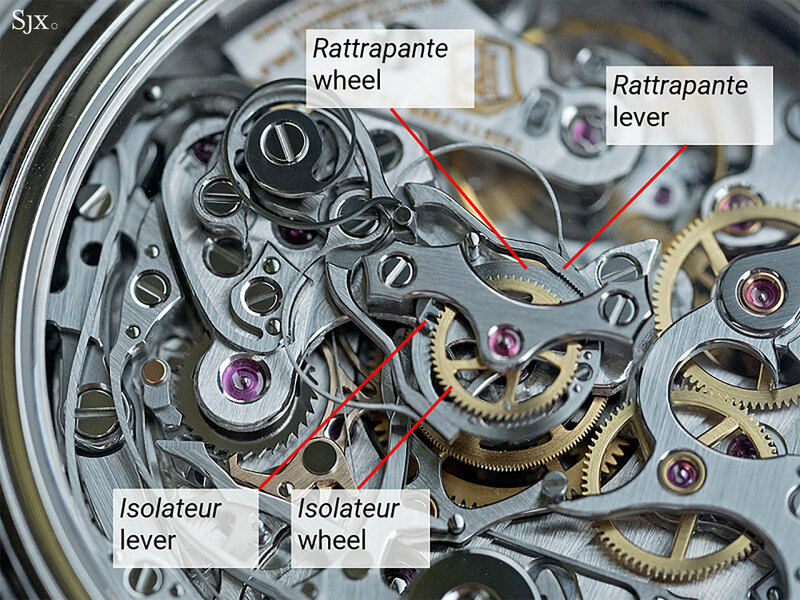 Essentially a shaft with gears on each end – one end is constantly engaged with the gear train and the other pivots clockwise to engage with the chronograph when activated – the oscillating pinion is rarely found on traditionally constructed chronographs. In fact, it’s best known for being inside the Valjoux 7750. And because of the oscillating pinion, the chronograph levers have also been redesigned for it. That, combined with the fact that the oscillating pinion is small, explains why the movement appears more sparse. 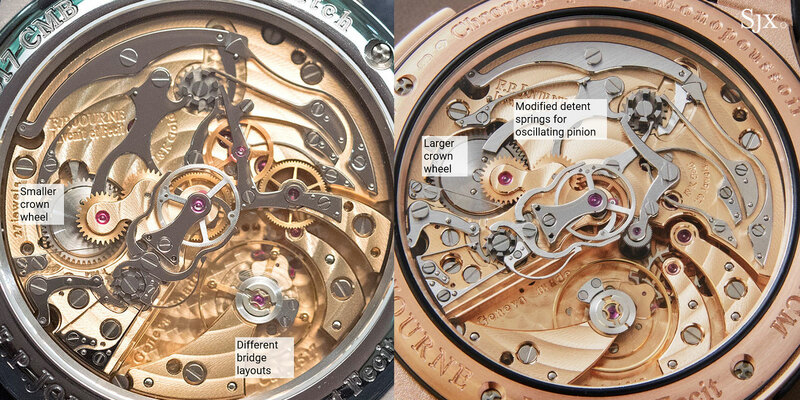 The differences between the two movements go beyond the chronograph mechanism. The base movements are also dissimilar, right down to the three-quarter plate, finger bridges for the wheel train and base plate. 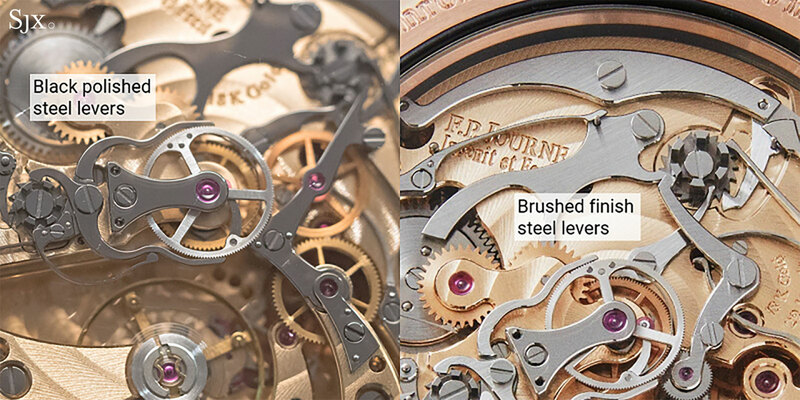 Another notable difference between the two is the crown wheel for hand-winding. It’s larger in the cal. 1518, in order to accommodate the setting mechanism for the date display, since the date is also set via the crown. Unsurprisingly, given that it was inside a unique piece for charity, the cal. 1517 is finished more elaborately. The levers and springs of the chronograph mechanism are black polished to a mirror-like finish, while the same parts in the cal. 1518 have a conventional straight grained finish. Of the three iterations of the Line Sport rattrapante, my vote goes to the titanium model. It’s light, easy to wear and the most value, making it a compelling proposition. The only downside is the aluminium movement, which looks less fancy than to the gold movement. But for the equivalent of US$58,000, the titanium rattrapante is the best value for money in the split-seconds segment today. It’s worth pointing out that the platinum model is a compelling idea, being an ultra-luxe sports watch, but the purple dial is an acquired taste. But it would not surprise me if additional dial options eventually come along, especially since the case and bracelet will eventually be facelifted to remove the rubber bumpers. The lineSport Chronographe Monopoussoir Rattrapante is priced at SFr58,000 in titanium, SFr78,000 in red gold, and in platinum it’s SFr106,000. They are already available at F.P. Journe boutiques and retailers. The Line Sport split-seconds debuts. Titanium and bright yellow dials. With oracle bone script numerals.